We should have the 3-D views of nanoFlash and the preliminary spec sheet on our website next week. But, I wanted to give you some of the major highlights for your review and comment, as we are going into PCB layout and cabinet design next week. The target applications for nanoFlash are HD-SDI cameras with embedded audio and time code as well as POV cameras which utilize a separate audio capture device. We do plan to publish the complete remote control / status command protocol for nanoFlash and Flash XDR, so users can create their own PC based applications, such as video assist. You will be able to control multiple boxes by creating an RS-485 (twisted pair) network. Additionally, you may be able to use wireless USB to RS-232 devices, but none have been tested. 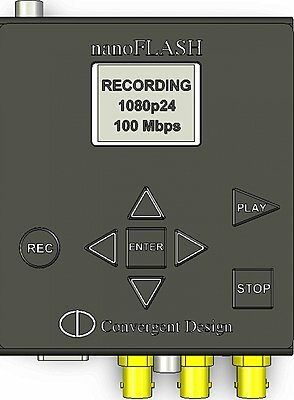 So compared to Flash XDR, you have a much smaller package and lower cost, but give up analog audio I/O, two Compact Flash slots and ultimately the ability to do uncompressed. Does it come with a hot/cold shoe mount as standard? 10W should be easy to power from the camera. Would be great for mounting on the EX3 instead of the PHU-60K harddisk. "9) +5V power output tap to power HDMI <-> HD-SDI converters (nanoConnect, nanoView)"
In April you were saying that the nanoFlash had HDMI in. Here's a quote from you: "nanoFlash will have HDMI and HD-SDI inputs". Great idea, let me do more research on this shoe mount, it certainly seems possible. Besides, you'll get a significant improvement in video quality over a hard-disk, which merely copies the native video quality from the camera. We'll have a battery mount option similar to the PHU-60K harddrive. Interestingly, we'll actually have more capacity with two 32GB CF cards, than the 60GB hard-drive option. We have an ultra-small (2"x2") version of our nanoConnect (HDMI to HD-SDI) converter coming soon. We are working on a very clean mounting system to the nanoFlash box, so they can be used as one unit. We have heard a number of requests for both HDMI to HD-SDI (for capture) as well as (HD-SDI to HDMI) for playabck. We could not accommodate both directions, so we are working out a mounting system for both our nanoConnect and nanoView boxes. I think you will be pleased with the end result. We want to support HDMI cameras and will do our best to facilitate this application. I don't think the end result of nanoFlash + nanoConnect will be much bigger than if we had added the HDMI circuit inside the nanoFlash box. We have an ultra-small (2"x2") version of our nanoConnect (HDMI to HD-SDI) converter coming soon. So the original spec of 4 x 4 x 2 is now 4.2 x 3.7 x 1.4 PLUS a 2 x 2 x ? box somehow attached to the other box - oh dear ... is that right? I have your NAB press release framed on my wall. There, I've taken it off the wall. Another of my hopes and dreams crushed. Will the new, just announced, mini-nanoConnect and the nanoFlash be released simultaneously? My framed copy of your PR release (now in the bin) says Q4 08. Still a great step forward - can't wait. Needed it yesterday. We'll have a battery mount option similar to the PHU-60K harddrive. Interestingly, we'll actually have more capacity with two 32GB CF cards, than the 60GB hard-drive option. Well, a bit "apples and oranges" but capacity (however you define that) is just part of the equation. I like that it will be a small dedicated device with lower cost CF cards bringing enhanced recording to platforms like the XDCAM EX. Yes, your understanding of the dimensions is correct. We didn't get the HDMI inside the nanoFlash, as we had hoped, but we moved up the release date by several months. Yes, the nanoFlash and the new mini-nanoConnect will be released simultaneously. I think it will be an very acceptable combination. Yes, the nanoFlash and the new mini-nanoConnect will be released simultaneously. Go on - give us a rough date - Aug, Sept, Oct? Here's a front view of nanoFlash, I will post the press release shortly. I made a post in the EX1 forum, but just for clarification, every camera I have tested will output an invalid timecode (all 1's) when operating in "live mode". Once the record button is pressed, the time code becomes valid and starts incrementing. That's our trigger to start recording. We'll have an EX1 early next week and test this "feature" as well as overcrank/undercrank recording question.